Is production version of Estoque on the way? The 2008 Lamborghini Estoque offers a hint of what the maker might offer as an "everyday" car. When the new Lamborghini Aventador was introduced, earlier this year, it included a feature that allows a driver to slightly raise the nose to prevent the front wing from scraping on speed bumps or steep driveways. For the Italian maker, that’s about as big a concession as it has ever made for day-to-day driving – most owners pulling their Gallardos and Murcielagos out of the garage only on weekends or special occasions. What Winkelmann has in mind remains to be seen. In fact, he told TheDetroitBureau.com at the recent Geneva Motor Show that final plans are still under review and likely won’t be completed for some months to come. But one possible direction was offered up by the automaker in the form of the Lamborghini Estoque concept car that was introduced at the 2008 Paris Motor Show. The show car took a decidedly different approach from the classic Lambo, using a front-mounted engine layout and four doors. In concept form it also featured a 5.2-liter V10, though V12 and V8 options were also hinted at. The Estoque did maintain Lamborghini tradition, however, by lifting its name from the bull ring, an estoque being one type of sword used by matadors. Whether a production daily driver would come in close to the nearly $500,000 Aventador the Italians will launch later this year or something even lower than the current Gallardo line remains to be seen, according to Winkelmann. Lamborghini’s interest in a more practical sports car isn’t surprising. Even Ferrari has gotten into the act, introducing the wagon-like FF at the recent Geneva Motor Show. Porsche’s 4-door Panamera, despite its controversial design, is rapidly becoming one of its best sellers, while Aston Martin has scored a big success with the 4-door Rapide. Lamborghini could use something to build its own order bank. The maker was hammered by the global economic downturn, despite growing demand in emerging markets such as China. From its peak sales of 2,430 cars in 2008, volumes plunged to just 1,302 in 2010, leaving dealers struggling with unsold inventory. Winkelmann told the Reuters forum he is hoping to build demand back up to 1,500 this year, in part with the upcoming launch of the Aventador. 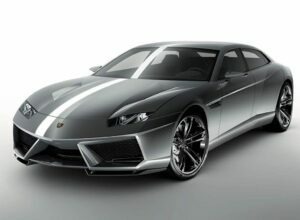 Named for a fighting bull, Lamborghini claims it has an 18-month backorder for the new flagship supercar. Lambo has set a goal of reducing the carbon dioxide output of its various models by 35% over the next product cycle. There’s a direct correlation between fuel consumption and CO2 output, so the Aventador puts the maker on the right path, delivering a 20% improvement in mileage despite its significant increase in power. Improved engine design certainly helps, but a critical step came with the switch to strong yet extremely light carbon fiber for the Aventador’s monocoque and other key components. “We have to find ways to reduce weight,” stressed Winkelmann, and that’s a key to getting there, he adds, noting that the new supercar is about 200 pounds lighter than the old Murcielago. A new daily driver would likely also make use of carbon fiber and other lightweight materials, according to industry experts.